Bell Labs, birthplace of technological breakthroughs like the transistor, the laser, and communications satellites, may have arrived at the end of its storied history. Industry support of basic research has been on the wan for years, but federal policies can bolster public and private R&D. But industry-funded basic research has been on the wan for some time. In the last decade, the number of basic research papers authored by industrial researchers in peer-reviewed journals dropped 30 percent. In 1988, those researchers published almost 1000 papers on basic physics; in 2005, that number was 300. Bell Labs’ Telstar I, the world’s first communications satellite, was launched in 1962. One effective step the government can take has become a mantra of progressive champions of science and technology: double the federal investment for R&D, or at the very least for key research agencies. The Bush administration’s final budget request for FY2009 didn’t do it, but there have have been glimmers of hope that some supplemental funding could come through before Congress finalizing the next budget at some point early in the next administration. Yet that only addresses the issue of declines in federal investment. Until the late 1980s, the United States provided the most generous R&D tax incentives of any industrialized nation in the world. In 2004, we were in 17th place. Moreover, the credit is not permanent; since its introduction in 1981, Congress has had to extend it 11 times; it expired twice. Without consistent incentives, corporations cannot make reliable decisions about investing dollars in R&D. If forgoing that additional research means fewer productivity increases through information technology and less economic growth, that’s a significant loss. Congress should at the very least make the credit permanent, as John Irons and Tom Kalil argue. But what kinds of future breakthroughs might we not even know we’re missing? Bell Labs also takes credit for the UNIX operating system, touch-tone telephones, and world’s first cellular network. Word is that those turned out to be kind of a big deal. Bell Labs, birthplace of technological breakthroughs like the transistor, the laser, and communications satellites, may have arrived at the end of its storied history. According to a recent report in Nature (subscription), the icon of industry-supported science has all but shut down basic research, with four physicists remaining at the facilities in Murray Hill, New Jersey. Company officials at Alcatel-Lucent downplay the issue, saying that research has merely shifted away from basic physics to "mathematics, computer science, networking and wireless." But industry-funded basic research has been on the wan for some time. In the last decade, the number of basic research papers authored by industrial researchers in peer-reviewed journals dropped 30 percent. In 1988, those researchers published almost 1000 papers on basic physics; in 2005, that number was 300. 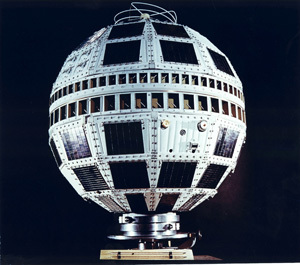 Bell Labs' Telstar I, the world's first communications satellite, was launched in 1962.